GAFM Accredited Providers may post training courses on the GAFM training calendar. There is no limit to the number of courses that you may post. In order to post you must first become an Accredited Provider and then we'll grant you access to the calendar. Sign in to the website with your username and password, then follow the directions below to post training courses to the calendar. On the main menu Education > Training Schedule > Group Home (house icon). Click on the blue person icon Group Admin Options and a popup menu will appear. Select Add a New Event from the popup menu. 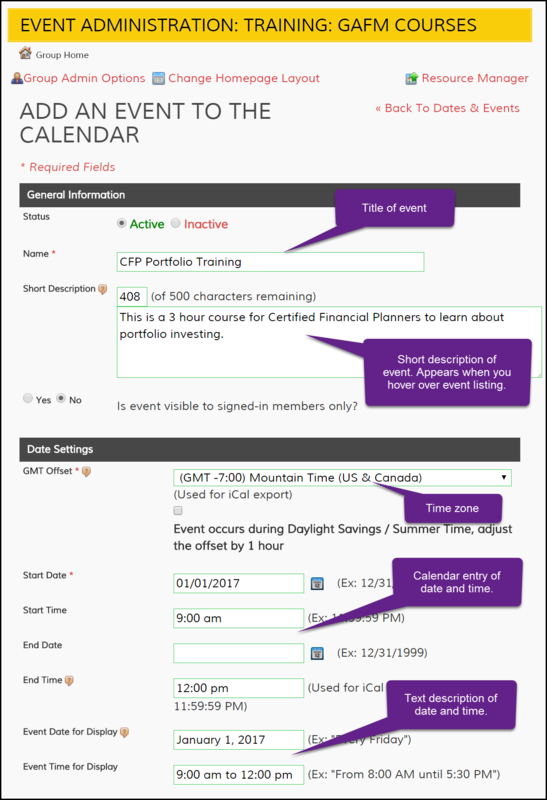 On the Add an Event to the Calendar screen, choose the fields and options that pertain to your training course. Select No from the Send Notification? popup. Event posted on the Training Schedule. Event details when you click on the event title.